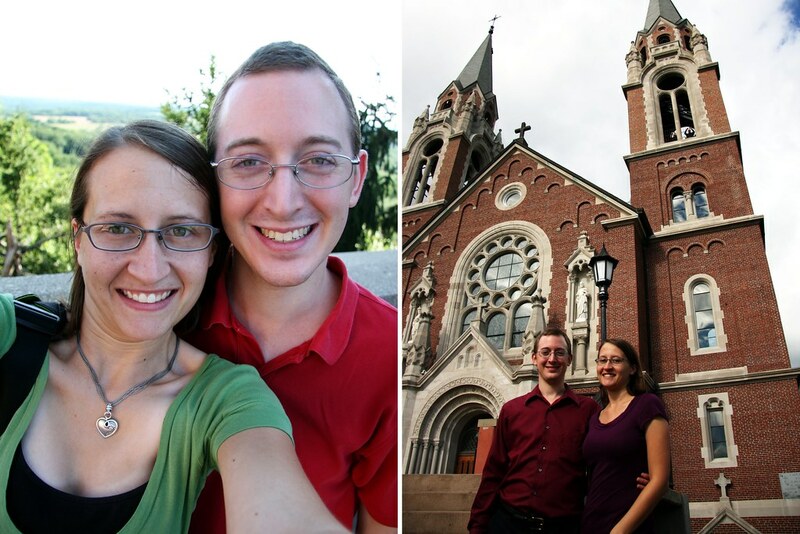 We ended up visiting our third basilica – the Basilica of the National Shrine of Mary, Help of Christians at Holy Hill (usually referred to as just Holy Hill) – right after our second (St. Josaphat) on September 4, 2011. You may recall that we stopped by here back in July, but this time we went for a longer visit. We’ll be back again in two weeks on April 28, 2012, when Cardinal Dolan celebrates Mass. 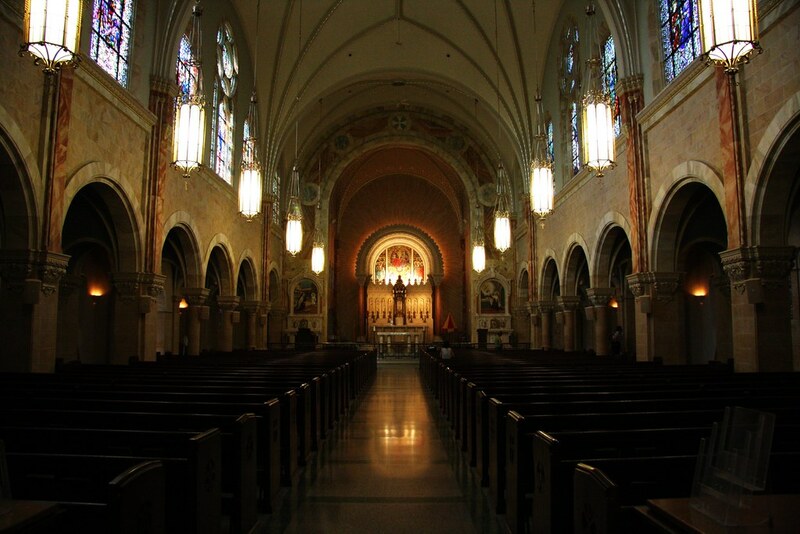 Located out on its own in rural Hubertus, Wisconsin (northwest of Milwaukee), this basilica is certainly much more isolated than others and was a stark contrast to St. Josaphat’s, which is located in downtown Milwaukee. While I’ll write about some parts of the basilica’s history here, if you’re interested in a more thorough version, I suggest the History of the Basilica page hosted by Holy Hill. As the name suggests, the basilica is built on top of what was initially a 289 foot high hill (it has since been leveled at the top for the current church). 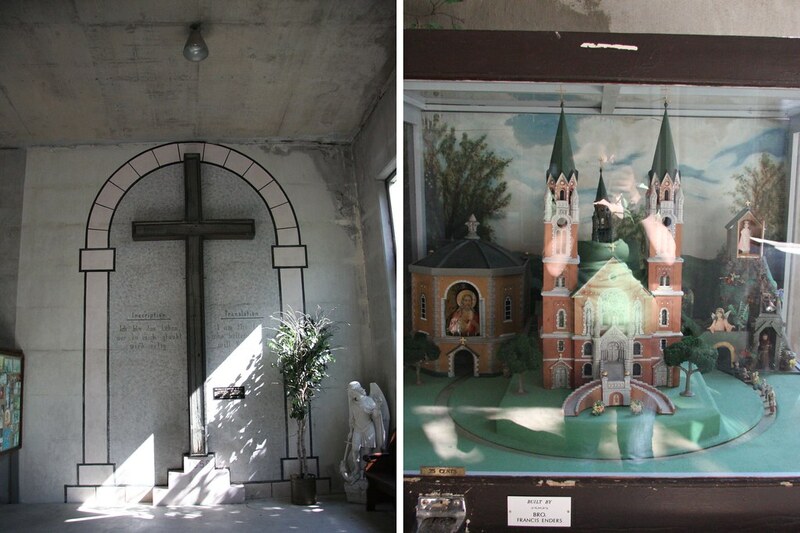 The hill’s association with Mary began in the 1670s, when tradition has it that Jesuit missionaries placed a cross and stone altar atop the hill, dedicating it to the Blessed Virgin. Later, in the mid-1800s, a hermit named Francois Soubrio was discovered living on the hill by local farmers. 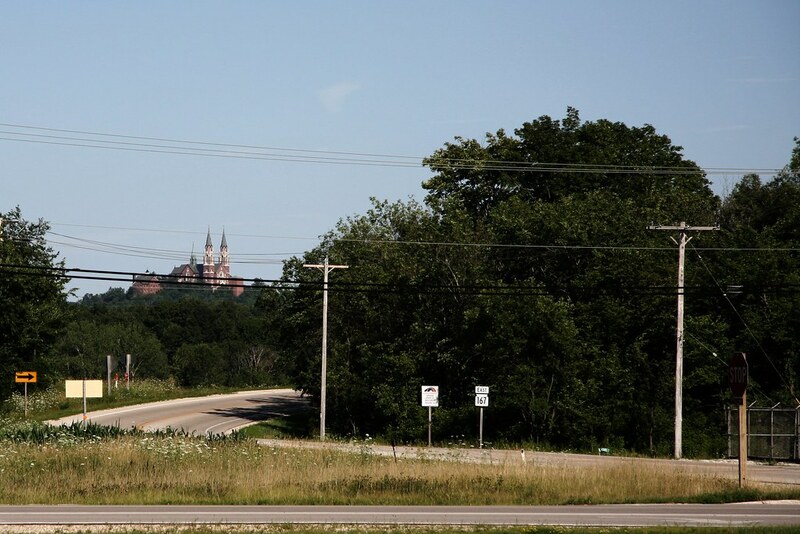 Soubrio had supposedly discovered a diary kept by one of the Jesuit missionaries, which described the hill in Wisconsin. Soubrio – who was originally from France – felt a longing to visit this hill, and left his job in Quebec to journey to Wisconsin. The shrine has had three incarnations – first as a small log cabin (built in 1863), then as a shrine and retreat center (1880-1925), and finally the shrine as it is seen today, which was completed in 1931. In 1906, it was decided to have a group of religious run the shrine. The church is currently under the care of Discalced Carmelite monks, who initially came from Germany in 1906 at the invitation of the Archbishop. Since the current shrine was built after the Carmelites took custody of Holy Hill, there is a subtle Carmelite influence in the artwork throughout the buildings on the grounds. While the grounds of the basilica are vast, there are four main areas I want to highlight: the upper sanctuary, the shrine, the lower sanctuary, and the tower. I’ll touch very briefly on the rest of the grounds at the end. Starting from the parking lot, you have the option of climbing the stairs up to the church, or taking the elevator. I recommend the climb, but be sure you’re wearing the shoes for it. Given that we had just attended Mass at the Basilica of St. Josaphat, I was sporting a classy outfit and tennis shoes, having decided that this probably wasn’t a good place for heels. My boyfriend was fine in his dress shoes though. You will eventually come to a small landing where you can enter the lower sanctuary or one of the towers (both of which are discussed below). Continuing up one more flight of stairs will bring you to the entrance for the upper sanctuary of the church. You can see the umbraculum and tintinnabulum to the right and left of the altar respectively. The entire sanctuary is saturated in Marian images. The stained glass that lines the sanctuary depicts events in Mary’s life, while the stained glass at the back of the church honors Mary in her title as the Immaculate Conception, the patron of the US. Off to the right of the upper sanctuary is the Shrine of Mary, Help of Christians. Lining the entrance to the shrine are crutches and other physical aids left by those who have been healed by petitioning Our Lady for her intercession. The statue depicts Mary presenting Christ to the world. Made in Germany, it was brought to the US in 1876 by a group attending the Philadelphia World Fair. At first, it resided in a nearby church, but was moved to Holy Hill (then a log cabin) in 1878. The stained glass lining the shrine depicts portions of the Hail, Holy Queen. At first glance, it didn’t look like much. But upon further inspection, it’s the lineage of Christ. 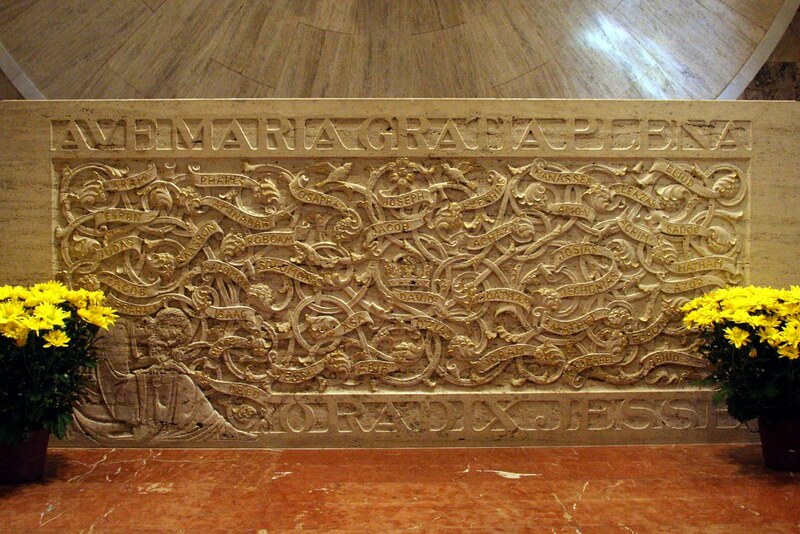 The words above the depiction read “Hail Mary, Full of Grace,” while the bottom translates as “O Root of Jesse.” In the bottom left corner of the altar sits Abraham, dreaming of his many future descendants. If you look closely in the center, you can see a crown just above David’s name. Immediately below the upper sanctuary is the lower sanctuary. 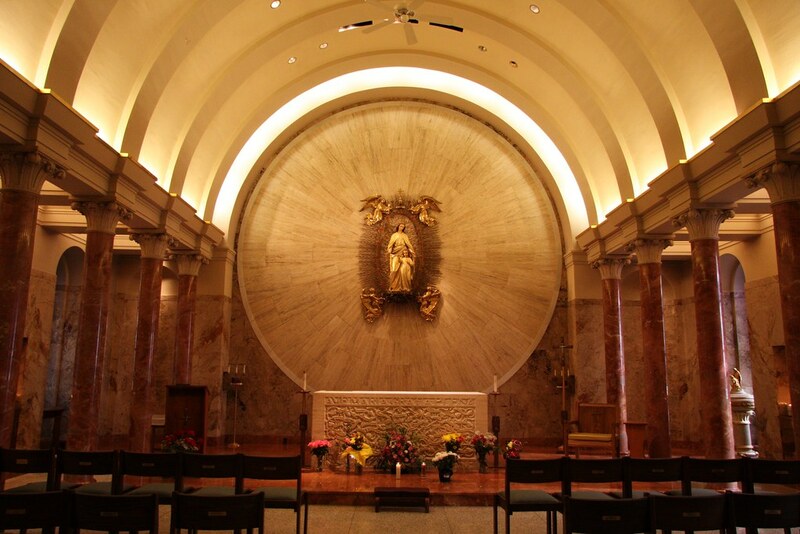 The lower sanctuary is also called the Chapel of St. Therese of the Child Jesus, hinting at the Carmelite influence. The chapel and side altars are decorated with roses and rose stems, symbolic of St. Therese. The landing outside of the lower sanctuary features some artwork, news clippings, and historical displays related to the shrine. In particular, the replica of the church on the right below has moving parts that perform when you pay a small amount (25¢ or 50¢). It takes some artistic license, since the church is perched high on the hill, but it’s fun to watch. It can be physically challenging to reach most parts of the church (lots of steep climbs! 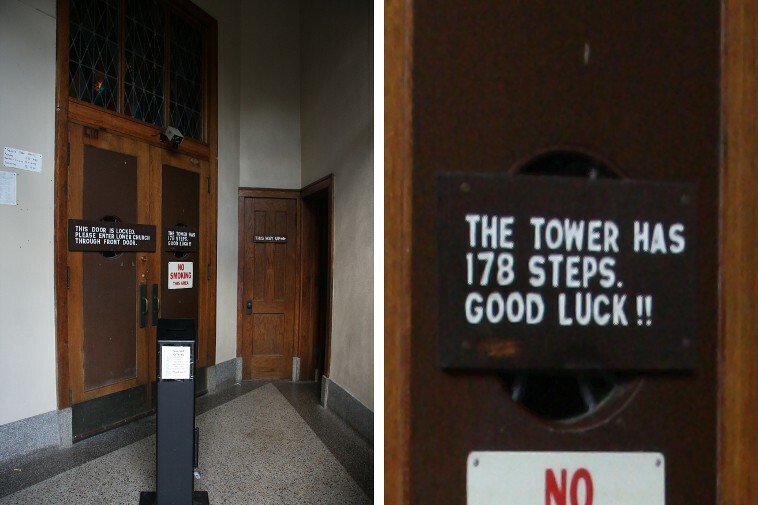 ), but the most difficult is the tower. If you’re facing the church, the rightmost tower is open for visitors to climb – no elevator for this part. Keep in mind that it’s shut in the winter due to the Wisconsin snow. 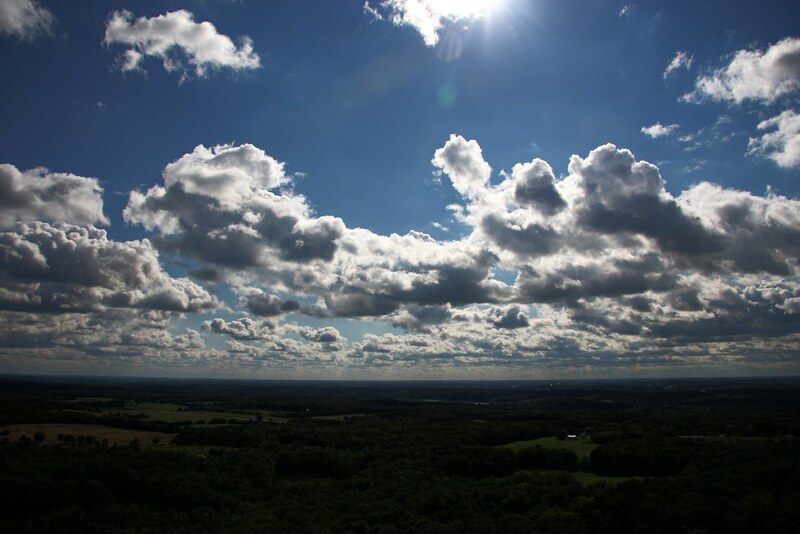 Reaching the summit after 178 steps offers you a wonderful panoramic view of southeastern Wisconsin. And if you look closely, you can even see the Milwaukee skyline off in the distance. I mentioned on my previous post about Holy Hill that we were waiting for a more formal visit until the leaves had changed color. This view is why. If you want to try for the fall colors, I highly recommend checking out Wisconsin’s Fall Color Report ahead of time to gauge the progress of the trees. Since Holy Hill is a relatively short drive from where I am (as well as my closest basilica), my boyfriend and I are hoping to try again another fall. 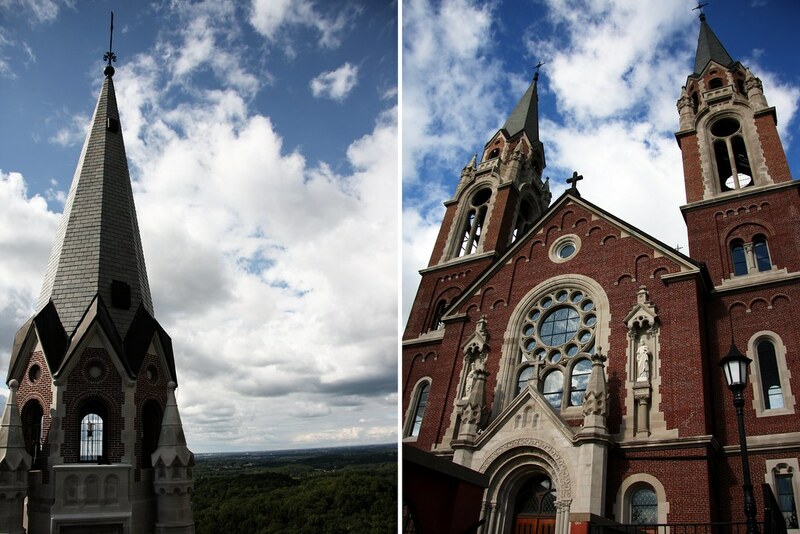 While the two sanctuaries, the shrine, and the tower are the highlights of a trip to Holy Hill, there are several other aspects. The Discalced Carmelite monks have their living quarters behind the church. They also run a retreat center and cafeteria that is open for visitors to eat at. The Stations of the Cross line a long path around the grounds. 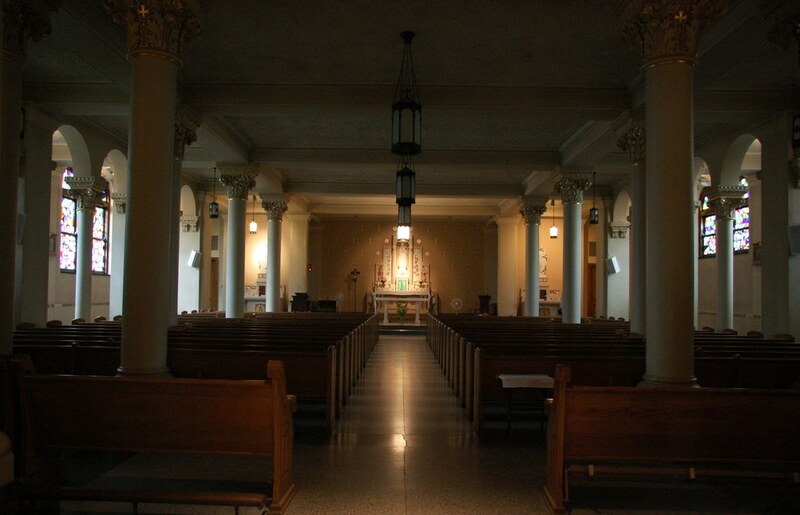 There is the Marian hallway which connects the elevator to the lower church. Finally, there’s the gift shop, which is accessible on the same level as the parking lot. If you’re looking to take the elevator up to the various parts of the church, you can find it nearby the gift shop. And finally, a picture in front of the church! Well, two – one from our first visit on the left, and another from this most recent visit on the right. Since the church is only accessible from a small platform in front of it, we went with an unusual angle to try and fit the church in there. If you look closely at the top of the tower on the far right, you can see someone with his arms raised looking out. Apologies for the long delay between posts, as I know some people were looking forward to hearing about Holy Hill! I’m hoping to ramp up the frequency of posts to get my closer to where I currently am. That altar is just beautiful! I think the sunlight playing with the clouds makes up for not having fall color in that awesome view. You did a great job with framing that image. Thanks for the beautiful pictures! I look forward to seeing it in person in two weeks when my husband and I head up there. He just entered the Church this Easter, so I think it’ll be an even more meaningful experience than if we’d made it there back in the fall when we’d first intended to go. Glad you all will finally be able to make it out there – it sounds like a long time coming. ^_^ Congratulations to your husband for entering the Church also! It truly is a wonderful time to be Catholic.